Do you want to witness one of the most famous Carnival Parades of the world? 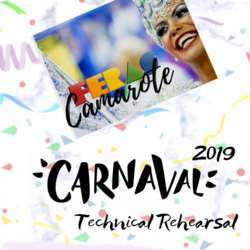 Come to the technical rehearsal 2019 of samba schools of Rio de Janeiro that enchant thousands of people every year at iconic Sambodrome. 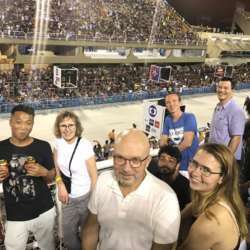 Enjoy the Feras do Carnaval skybox (camarote) experience with InterNations and see what to expect during the actual Rio Carnaval in March. Join us for an authentic and enjoyable evening. 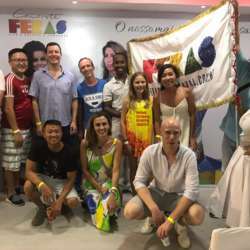 The skybox Feras do Carnaval will open its doors exclusively to welcome InterNations. Beija-Flor, winner of 2018 Carnival, will be one of the samba schools to rehearse on Sunday. You can't miss it! Baianas, the women dressed in big white round colonial-style skirts, will perform the traditional cleansing ritual of Sambodrome. One week before Carnival, they cross the avenue with palms, leaves, smokers, and brooms to prepare the place for the big party that will start on Friday. Feras do Carnaval is a magazine specialized in carnival content. For convenience, shuttle vans service will be available at the meeting point from 18h to take attendees to Sambadrome. 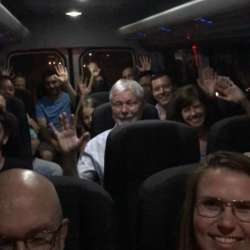 We highly recommend using the shuttle as it can be a bit complicated to arrive there on your own. * The bar accepts only CASH!